One of my wife Lori’s favorite walks is the 3.8-mile-long path around Lake Estes. Because the thought of that trek makes my feet ache, I talked her into a bicycle ride instead. She’s a good sport.Early Saturday morning we parked at the Visitor Center parking lot and unloaded our mountain bikes. Because the path is a favorite with folks walking their dogs, I let Lori go first because she has a little bell that goes ding-ding, warning walkers that speeding bikes are about to pass.Of course, we don’t pedal that fast. We go slow enough to dodge a mamma duck and her ducklings waddling across the path to the Big Thompson River. 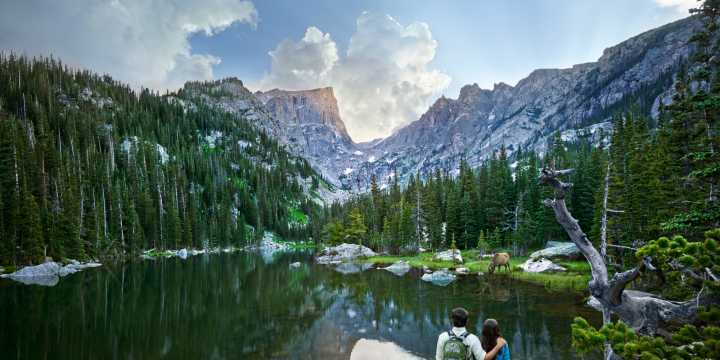 As the path followed the lake’s north shore, Longs Peak is reflected like a picture postcard in the lake’s still waters.At the Estes Park Marina, folk can rent mountain bikes and surrey pedal carts, where visitors pedal side by side on a bench seat. At our family reunion four years ago, my two nephews rented a tandem bike. For two boys who never agreed on anything, they still managed to ride all the way around the lake without fighting.Beyond the Marina, we zoomed east down the path and across the bridge below the dam, where fly fishermen stood in the river and cast their lines into the Big Thompson. Here the path flattened as it passed through marshy wetlands, and then climbed along Mall Road to Highway 36. Gasping, we paused to catch our breath and gulped down some water while admiring the view of Longs Peak to the south.The ride down the south side of Lake Estes is a steep downhill, so we built up a good head of steam before we braked at the tunnel where the path forks. A left turn takes the rider past the dog park and ball fields to Fish Creek Road and beyond, where the path eventually loops back into town, more than doubling our ride. This morning we’re not that ambitious, so we continued on the path past the Dannels Fire Station back to the Visitors Center.Lori, good sport that she is, demanded some liquid refreshment after our ride. So we rode through the tunnel under Highway 36, where we dismounted and walked to Kind Coffee along the river. We enjoyed lattes under a shade tree, listening to the Big Thompson and watching the visitors walk past. What a perfect morning.